Image Editor allows you to easily edit your jpg, jpeg, gif and png images inside Modern Editor or in the Media section of WordFly. The WordFly Image Editor is tailored just for people who build emails and page designs. 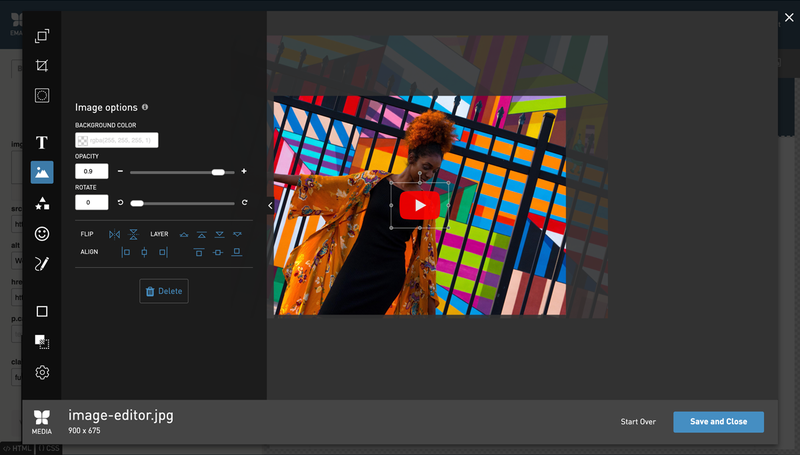 The image editor can crop and resize images, combine multiple images in one file, add any play button style or a logo, add text on an image, and much more. 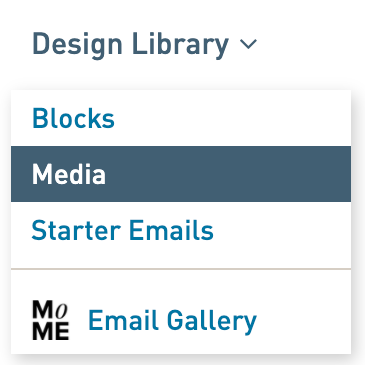 Access the Image Editor wherever you are using your images in WordFly: inside Modern Editor (email or page designs) or in the Media section. See your image dimensions in the lower left corner, under image name. Use the left navigation to access editing options: resize, crop, add text, add images, add shapes, add a border, adjust settings for the image as a whole (such as rotate, set background color, and options to export image). Easily start again by clicking the Start Over link in the lower right corner. Once you Save and Close the Image Editor your image is updated and those changes cannot be edited again. Export your image under the Settings cog. Image Editor is accessible in Modern Editor when you are building your emails and Pages, as well as in the Media section of WordFly. Whether you're working on an Email design or in a Page design, you can access the Image Editor in Modern Editor to modify your image. In the Media section there are two ways to access the Image Editor. Upload an image in the Media section of WordFly and then select Edit to start modifying the image file in Image Editor to meet your needs. 2. Locate your file in the Media section. 3. Select the file name and then select Edit. 5. The Image Editor will load and you can start editing. Or, after uploading your image in the Media section, select the image preview to the left of the image name and then select the Edit button. 6. The Image Editor will load and you can start editing. Resizing images can be done in a couple of ways using Image Editor. Use the resize tool when you want to retain the entire image, but only make it smaller or larger (in dimensions or downloadable file size). Your original image dimensions are maintained all the way until you click the Save and Close button. If you click Apply, but need to make adjustments, click the Resize icon again to start over. 3. Enter the width -or- height that you would like your image to be in pixels. The other field will update automatically. Images with larger dimensions generally are larger in file size and take longer for your subscribers to download. If your email contains a lot of these images, it's worth taking the time to resize them so they are only as large as they need to be. If you enter a width or height that is larger than the current dimensions, the image will likely become blurry. Find a larger source image if possible. By default, the Lock icon is active. This will preserve the proportions of the image. Click the Lock icon to Unlock it. When Unlocked, you can enter any value into the width and height fields, but it will distort your image. High-density pixel displays may require larger image dimensions to preserve clarity. Use the crop tool when you only need to retain a selected area of the canvas. Your original image is maintained all the way until you click the Save and Close button. If you click Apply, but need to make adjustments, click the Crop icon again to start over. 2. Adjust the area for cropping. Using your mouse, drag the handles to the dimensions that you would like your image to be. The width and height fields will automatically update. If you enter values into the fields (in pixels), the handle selection will update. 2. In the Presets dropdown, select the proportion you would like to use (ex: Entire Image, or Square...). The handles and width/height fields will automatically update. Use the Clip tool when you want your image to appear as a non-rectangular shape in your email or page. For example, you can use it to create a circle-shaped image that floats on the background. Your original image is maintained all the way until you click the Save and Close button. If you click Apply, but need to make adjustments, click the Clip icon again to start over. When you click Apply, the base image will be clipped to the width and height of the clipping shape. If you resize your image after clipping, your clipping shape will be removed. Try resizing your image first, then applying a clipping shape. PNGs will be exported as transparent PNGs by default. JPGs will be exported with a white background color by default. You can choose a different background color in Settings. When you are choosing PNG or JPG in Settings, remember that PNGs can be larger in file size than JPGs. Try saving your image as a JPG with a custom background color, if needed, for a smaller file size. Adding text to images can help you convey a message in a more dramatic manner than a separate block of text would. You can set your Font Family to use any font installed your machine. Font Family shows a few default fonts, but you can enter the name of any font that is installed on your computer by typing the name into the field. You can use a Google or Typekit font, but it must be installed on your computer. Highlight Color adds color directly behind the text. Press the spacebar if you want to add padding around the highlight. Background Color adds color behind the entire text box. Press the spacebar or hit Return if you want to add padding around the text. Font Size is shown in pixels. Values can range from 10-200. Line Height is shown in ems. Values can range from 0-5. You can use Image Editor to add images onto the image being edited. This can be helpful for many reasons, including to indicate an image can redirect to video. 3. 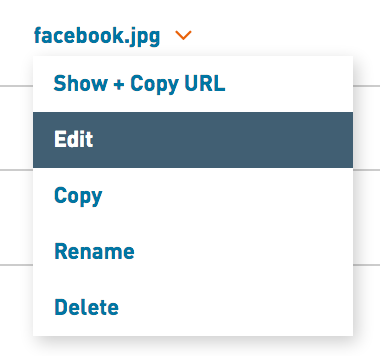 Click the cloud icon to upload a JPG, GIF, or PNG file (or drop your image on top of the icon). 4. Images with large file sizes may take longer to load inside the editor. 2. Select the image you want to add. Find additional image editing options on the left panel when your image is selected. Adjust background color that displays behind the added image. Select a color from the color picker or enter an RGBA color. Adjust opacity of the added image. The lower the opacity the more transparent the added image will be. To rotate, drag the top handle or use the Rotate options on the left panel. Add a shape to an image. Pick from one of our shape options which include: standard shapes (example: square, circle, triangle etc), arrow, email, basket, globe, location marker, chat bubble, volume, mic, camera, link, scissors, search, and home. Find additional shape editing options on the left panel when your shape is selected. Adjust fill color for the color of the shape. Select a color from the color picker or enter an RGBA color. Adjust stoke color and stroke width around the shape. You can also select a stroke style. 1. Click the Border icon in the toolbar. A solid black 15px-wide border will display by default. Use Adjustments and Filters to toggle various effects to your base image. You can select more than one to combine multiple effects. When certain options are toggled on, you will see an Edit icon that lets you control the level of the effect applied. Adjustments and filters only apply to the base image. If text or shapes are placed on top of the base image, they will retain their original styles and colors. B+W is literally black and white. If you are looking for subtlety, use Grayscale instead. Once your image has been edited, you have the option to export it for use in other places. Click on the settings cog icon to access export options. The higher the JPG image quality percentage, the larger your exported file size will be. This will affect load times of your emails. Be kind to your subscribers: Use the smallest image quality you can without degrading your image too much. If your JPG image has text in it, you may need to use a higher percentage to preserve legibility. If you save photos as PNGs, they will generally be fairly large in file size. PNGs are best when you want text or logotype to be transparent so they float on a variety of background colors.